Where Do "White Spots" Come From? by Robert Probert. An Introduction to Barrel Plating, by Frank R. Zemo of Polaris Plating Co.
Chrome Control by Geoffrey P. Whitelaw. Crib sheet for plating. A periodic table for plating, electrochemical equivalents, troubleshooting nuggets, other little used facts. 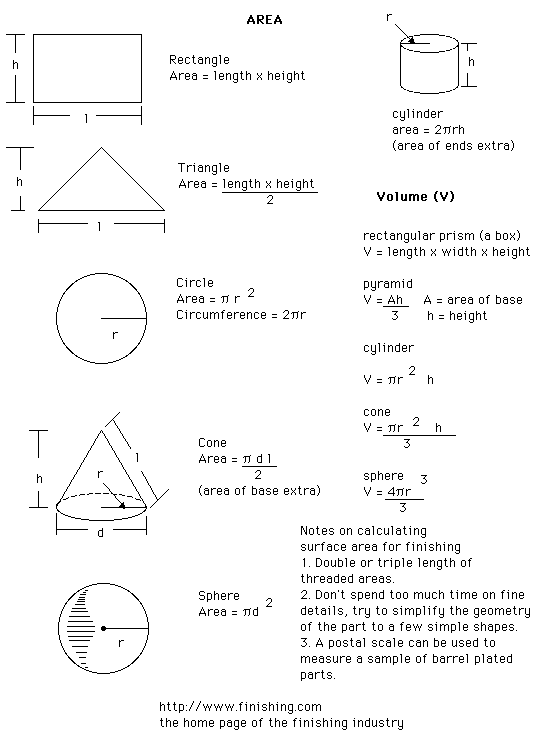 Formulae of surface areas and volumes of simple shapes. May we strongly recommend that you calculate the surface area of everything you finish. Think about it, this is SURFACE finishing. Improving your Chloride Zinc Plating Operation, by Stephen Schneider. RESEARCH PUBLICATIONS, BOOK CHAPTERS AND U.S.PATENTSby Dr. N. V. MANDICH, CEF (Since 1990 ): 2/04/02. Troubleshooting Modern Bright Nickel Plating Solutions, by Thomas J. Pullizzi. Paul Stransky has contributed an interesting paper on Flux Basics, some useful references on Nickel Diffusion Barriers and Solder Leveling, and a rather exhaustive review of the literature about Copper Plating of High-Aspect-Ratio Plated-Through-Holes. Rudy Sedlak tells us what Chelates are and why we use them; and gives us his take on the new technologies of Liquid Cleaners and Dry Acid Salts. The well-known chart of pH vs. residual concentration of metals in wastewater. Dr. Thomas H. Cook Dynamic Flux Tests for Hot-Dip Galvanizing. The Pretreatment Trouble Shooter -- reprints of Dave Wright's column in CCAI's Finishing Touch Newsletter, covering such topics as phosphating and salt spray testing. Powder Coating -- an introduction by Mario S. Pennisi. by Barlow Campano, Hidada Co. Ltd., Kingdom of Saudi Arabia. "The Kleingarn Regenerated Spent Acid at Increasing Ferrous (Fe+2) and Ferric (Fe+3) Chloride Content"
Plating Shops for the Nineties and Beyond, a design guide by Ted Mooney. 20 Ways to Cut Water Usage in Plating Shops, some tips from Ted Mooney. Hard Chrome Plating - Materials to consider, by Freeman Newton. Please Don't Leak on the Job - A guide to cementing PVC Pipe, by Freeman Newton. A possible alternative to Nickel or Chrome plating, the Kolene salt bath quench/polish/quench process. Closing the Quality Gap on Textured Molds: High Quality Surface Finishes Make the Difference, and Equation for Efficiency: FF + f/P Nearly Eliminates the Need for Polishing --two articles by Midwest Mold and Texture Corporation. End of Life (Vehicles) European Directive (English language) posted 11/29/00. Rudy Sedlak tells us about Stripping Resists … and the hell involved in Stripping Tin and Solder from small holes on thick boards. Illustrated trouble-shooting guide in rhyme from 1955. An often overlooked place to search for topics or authors is in conference proceedings. Just open the following pages, use your browser's 'Find' command to search out what you're looking for, then order the conference proceedings from the event's sponsor. Schedule of Technical Sessions from AESF WEEK '96, and AESF WEEK '97. Schedule of Technical Sessions from AESF's SUR/FIN '96, and Sur/FIN '97. Interview with a Vampire--a conversation (out of whole cloth) between an ISO9000 auditor and a client. An open letter from University of Baltimore's Merrick School of Business regarding new technology of divalent chromates.